I challenged myself to completely reimagine how a Gregorian/civil calendar could be represented. I initially developed the concept in 2006 (thinking about the growth rings within trees), and I considered what could be a new system to define the necessary information whilst maintaining the primary function of marking time. Something that is structured and elegant, yet playful; something that I would want to hang on the wall and look at. The result: 365 days and 52 weeks condensed down into one image. Each day of the week is defined by its own colour, and each week is represented by how many rings there are. 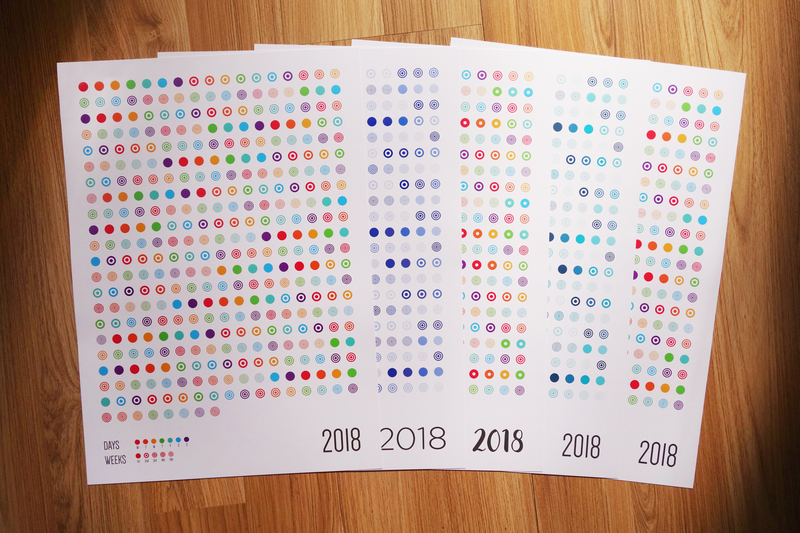 A limited edition set of framed prints were produced for the 2018 calendar year (with customised versions for each recipient), and this is likely to be something that I will continue to make for many years to come.